Throughout the province’s history, maps have played a central role in creating a visual representation of Manitoba. From the 1709 Samuel Thornton map of Hudson Bay and Straits to the 1873 map of the Postage Stamp Province, cartographers, explorers, surveyors and many others have created maps that described transportation routes, planned settlements, and defined the boundaries of this province. Mapping Manitoba, an exhibit now on display at the Archives of Manitoba, provides a glimpse of the remarkable map collections of the Archives of Manitoba. Featuring maps from both the Hudson’s Bay Company Archives and the Archives of Manitoba, it leads the viewer on a journey through two centuries of records. A small sample of maps from the exhibit is reproduced here. On 12 May 1870, the Province of Manitoba was born. The Manitoba Act set the provincial boundaries to include most of the former District of Assiniboia, with the 49th parallel as its southern border. Its small rectangular shape earned it the nickname Postage Stamp Province. But a growing population, along with the provincial government’s desire for increased revenues, meant that the tiny province needed to expand. In 1881, Manitoba’s boundaries were expanded to five times its original size. On 15 May 1912, the Manitoba Legislature passed an act calling for further extension of the provincial boundaries and Manitoba grew into its present shape. As the Hudson’s Bay Company’s main gateway into Rupert’s Land, York Factory was the entry point of goods and supplies destined for Lord Selkirk’s settlement at the junction of the Red and Assiniboine Rivers. As a result, the HBC needed to improve the water route from York Factory to the Red River Settlement. In 1824, surveyor William Kempt was hired by the HBC to do this. This map shows Kempt’s suggested changes to the route at White Fall Portage, situated on the Hayes River between Robinson and Logan Lakes. Some of these improvements were completed by Kempt and his crew. Source: Archives of Manitoba, Hudson’s Bay Company Archives, G.1/56. 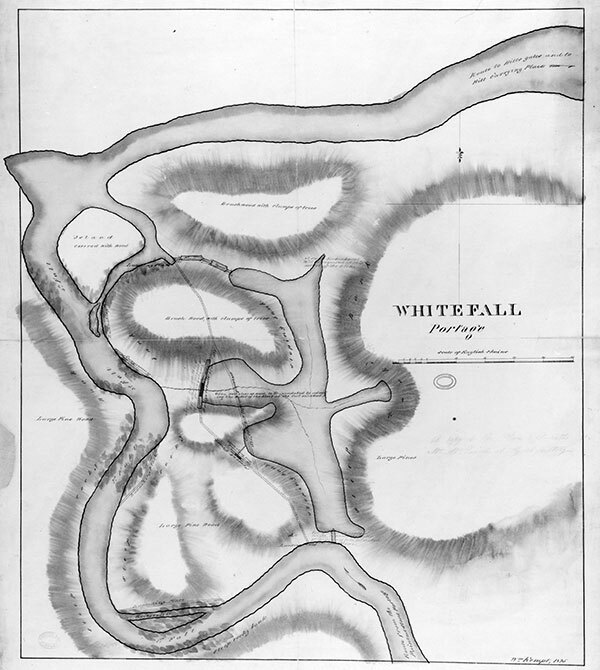 This portion of a cadastral plan of the Red River Settlement was created in 1838 by George Taylor, Jr., HBC surveyor to the settlement. A cadastral plan is used to define land boundaries and land units to determine land titles. 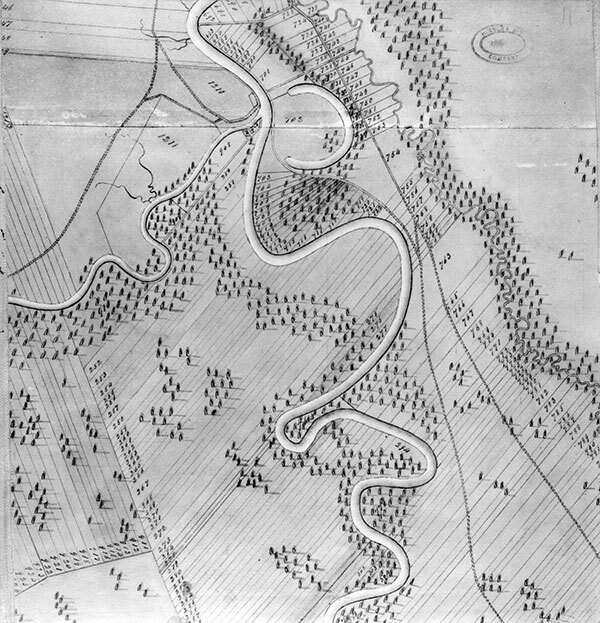 Taylor’s plan shows survey characteristics that shaped the Red River Settlement, such as two-mile (approximately three kilometres) long lots with an additional two miles of pasture, which were recognized by the federal government in The Manitoba Act establishing the Province of Manitoba. At the junction of the Red and Assiniboine Rivers, the lots were generally shorter as they ran into each other at the junction. 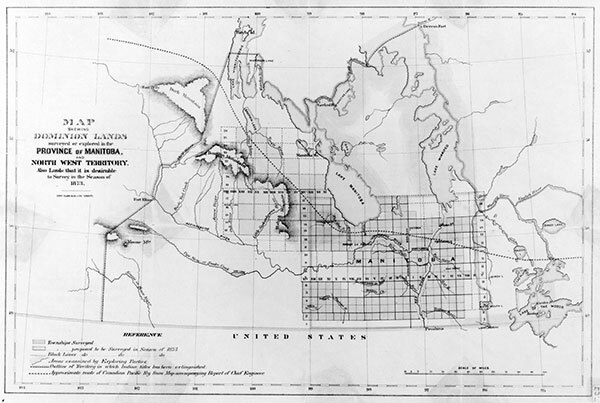 Although the Red River Settlement was resurveyed by Dominion of Canada surveyors in the 1870s, Taylor’s system and pattern still form the basis for Winnipeg’s legal land descriptions. Source: Archives of Manitoba, Hudson’s Bay Company Archives, E.6/14.